Ferry and rail services in Scotland have been cancelled as winds strengthen ahead of an Atlantic storm that is due to hit the UK later. The Met Office has issued a yellow 'be aware' warning for most of the UK for later on Tuesday, Wednesday and early on Thursday. For Scotland, it has been upgraded to an amber 'be prepared' warning. Severe gales have been forecast and sea swells for parts of Scotland of up to 40ft (12m). The amber warning has been issued for the Northern Isles, Western Isles - where all schools and nurseries will be closed on Wednesday - the north and west Highlands and Argyll. It warns of "very high waves" and islanders have been warned to take extra care on causeways that link up parts of the isles. Stornoway Coastguard has warned that the sea state could become "phenomenal", the term used to describe the worst conditions. Flood warnings have been issued for the Western Isles and also Corpach, Caol, Fort William and Glen Lyon. Richard Brown, of the Scottish Environment Protection Agency, said areas at the greatest risk of coastal flooding were Caithness, Sutherland, the Western Isles, Orkney and Shetland. 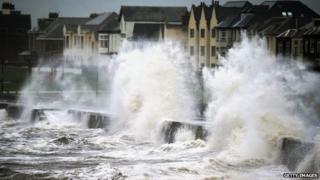 Argyll and Bute, Firth of Clyde, Clyde estuary and Dumfries and Galloway could also be affected, he said. Several train services on Wednesday have already been cancelled. They are Inverness-Kyle/Thurso/Wick, Ayr-Stranraer, Kilwinning-Ardrossan/Largs and Dumbarton Central-Helensburgh Central. Also, Glasgow Queen St-Oban/Fort William/Mallaig, including the Caledonian Sleeper. Network Rail said the routes were the most likely to exposed to 70mph winds and high tides. The company said replacement bus services would be considered, but these were dependent on road conditions. For the latest on the roads visit the BBC's travel news page and keep up to date with incidents and roadworks on the motorways here. Alternatively, for regular travel bulletins listen live to BBC Radio Scotland and follow @BBCTravelScot. In times of severe disruption you can also follow the BBC Scotland severe weather Twitter list of key sources. Below are a number of other traffic information sources. Ferry operator Caledonian MacBrayne has warned of severe disruption to its services. The Oban-Coll-Tiree, Tayinloan-Gigha and Ardrossan-Brodick sailings have been cancelled. A CalMac spokesman said: "The severe weather experienced across the west coast today has caused extensive disruption to our services across the whole network. "Strong gales and gusts of up to 80mph have delayed or cancelled sailings. "With the weather forecast to stay stormy for the next day or two we would urge passengers thinking of travelling to check the website or call the customer helpline on 0800 066 5000." Scottish and Southern Energy said it had gone on yellow alert which means it was anticipating power cuts. The company said it was monitoring the weather front and has put contingency plans in place to minimise any disruption to electricity supplies. A total of 23 schools were closed by Highland Council on Tuesday due to the weather conditions with almost 1,300 pupils sent home. The secondary and primary schools were mainly in Skye and Lochalsh but schools in Gairloch and Mallaig were also closed. BBC Scotland weather presenter Christopher Blanchett said the storm had rapidly developed in strength in a process known as explosive cyclogenesis, or what some refer to as a "weather bomb". He said: "This is where the pressure at the centre of the storm drops 24mb or more in the space of 24 hours. "The storm went through this process as it passed by the south of Greenland thanks to a strong jet stream running in excess of 230mph. "The powerful jet was caused by a stark temperature contrast - cold air to the north of it and warm sub-tropical air to the south. Where the two meet, you get the jet stream - a river of wind way up in the atmosphere, sitting at around 30,000ft. "Not only does it help to spawn weather systems, it helps steer them in our direction too." The presenter added said parts of the UK were due to experience the first powerful storm of this winter and will come with wind gusts of 60 to 70mph. The far north west of mainland Scotland, the Western Isles and Northern Isles could have winds of up to about 80mph. He added: "These wind strengths will have an impact on travel, causing disruption to ferry services and on road bridges. "The high winds could also lead to some small-scale structural damage, power supply interruptions and small branches being brought down. "Aside from the wind, the large fetch, or area of open water that the winds will be racing along before reaching land, will help to create some very big waves." University of the Highlands and Islands scientists monitoring wave heights off the Isle of Lewis expect them to reach sizes they have not previously recorded. Arne Vogler, of Lews Castle College UHI, said: "The coming storm has the potential to hit us with higher waves than the most severe event we have observed under the Hebridean Marine Energy Futures project. "Wave buoys and acoustic sensors that were deployed on 4 February 2013 off the Isle of Lewis had recorded extreme waves with maximum wave heights in excess of 25m observed at a location 15km north-west of Lewis. "I am anticipating similar or even slightly higher wave heights tomorrow, due to the combination of different atmospheric pressure systems and the long fetch across the Atlantic in which the waves can build up." On Monday, there were snowfalls over upland areas of Scotland and northern England, including Cumbria. Frequent wintry showers have also been forecast for Tuesday, Wednesday and Thursday, when the high winds are forecast to ease. The RNLI said some of those involved in maritime activities have dubbed Wednesday "Black Wednesday" because of the severity of the conditions expected. South Devon-based website Magicseaweed.com produces charts and swell models designed to help surfers pinpoint the best sites to enjoy their sport. Its swell chart for Wednesday shows a large black area indicating swells of up to 40ft (12m). The Atlantic storm has been moving towards the UK from the direction of Greenland and Iceland. Surfers from around the world are headed for Portugal because the conditions further north should mean large waves, but without the damaging winds.